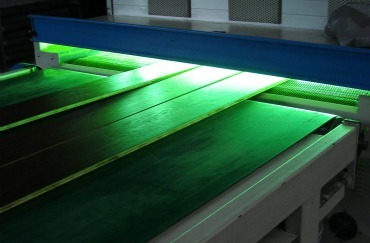 An oil based coating with chemicals added that enable UV drying, through a finishing plant. The finish is usually applied in several coats – typically three, through an industrial coating line. Like naturally dried oils, UV cured oil needs periodic maintenance depending on levels of traffic experienced. It is however easily repaired in the event of light scratching. Deeper scratches can also be repaired, in most case,s by sanding of the affected area of wood flooring then re-tinting and oiling as appropriate.